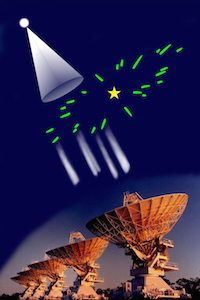 Manly Astrophysics is a scientific institute dedicated to research in astronomy. We focus on understanding astronomical data in terms of the underlying physical processes. Our work is explained in the "Projects" section. Some of the illustrations use CDFs, so you'll need the CDF-reader. It's free; please download it from here. At Manly Astro we've been a bit obsessed, lately, by radio twinkling. Those of you who've checked in here before might remember that this time last year we were reporting a radio twinkling event, lasting for a few months, in the quasar PKS1939-315. That was an exciting development because we were able to undertake an in-depth study of such an event for the first time. It has long been known that radio twinkling is caused mainly by ionised gas, lying between us and the quasar. The new data allowed us to determine the profile of the lump of ionised gas that was responsible for the brightening and fading of the quasar, and to rule out one of the theoretical models that had been proposed for such events. That discovery was made by a team of astronomers from CSIRO and Manly Astrophysics, as part of the ATESE project. This year the same team has made another interesting find: we've discovered Intra-Day Variability (IDV) - a rare form of twinkling in which a radio quasar varies substantially within 24 hours - in the source PKS1322-110. In this quasar the changes we're seeing are particularly large and rapid - really it's an intra-hour variable. Such variability is not unprecedented: there are a few quasars which have previously been seen to vary more rapidly than this one. 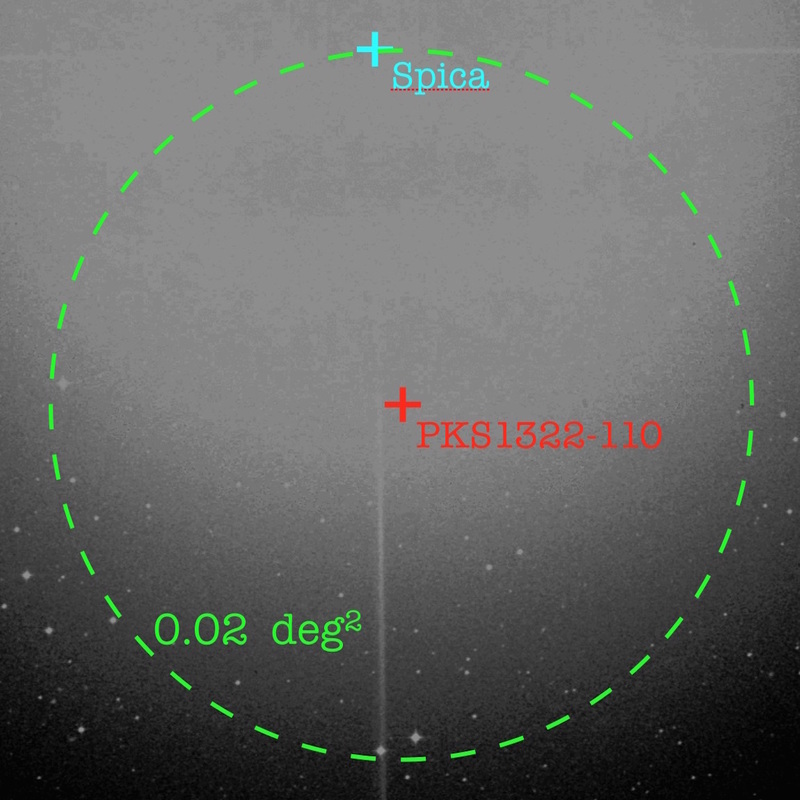 What is particularly remarkable about PKS1322-110 is that the bright, hot star Spica is very close to it - only 0.14 degrees away. 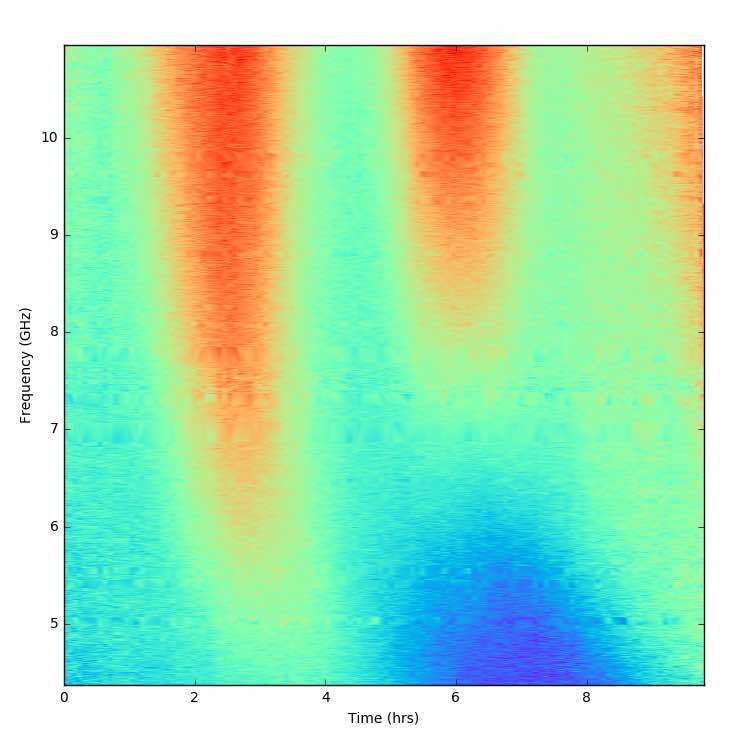 The brightness of the radio quasar PKS1322-110 (left), as a function of radio frequency, in GHz (vertical axis), over an interval of 10 hours. Large changes can be seen over timescales less then an hour. Observations made with the Australia Telescope Compact Array. At right is an optical image of the field around the radio source. The quasar itself can hardly be seen, as it's overwhelmed by light from Spica, located near the top of the image. Quasars are very distant objects - about as far away as you can get - whereas Spica is not far from the Sun (about 250 light-years), so the two objects are not physically connected, they're just near each other as you see them in the sky. But the radio waves from PKS1322-110 pass close to Spica on their way to us. So it seems likely that in this case the ionised gas is associated with Spica, the 16th brightest star in the sky. "Likely" is interesting, but "definitely" would be more satisfying. Can we say that? Unfortunately we can't, because we've only just discovered the twinkling of PKS1322-110: we don't have enough data to be completely confident of the association. But if the radio twinkling of PKS1322-110 is caused by ionised gas associated with a hot, bright star, maybe episodes of radio twinkling seen in other quasars were caused by ionised gas associated with other hot, bright stars? That seems like a reasonable guess. And it's testable because we can use data from some of the studies of twinkling episodes that lasted for years: detailed studies which precisely characterise the properties of the ionised gas. So that's what we did. Two IDV sources seemed to offer by far the best constraints: PKS1257-326, and J1819+3845, which had been intensively studied in the early 2000's by an Australian group and a Dutch group, respectively. In the latter case it had already been pointed out by the astronomers who took the data that there is a hot, bright star (Vega) a few degrees away from the quasar, and they suggested that the radio twinkling might be somehow related to the foreground star. But they were unable to confirm it. With the discovery of PKS1322-110 so close to Spica, we were convinced that they were right, and we looked at the data again. We found two new things that proved to be important. First, in addition to Vega being near J1819+3845, we discovered that PKS1257-326 is only a few degrees from the hot, bright star Alhakim. Secondly, for both quasars it was already known that the ionised gas responsible for the twinkling is highly filamentary - like a handful of noodles - and we found that the noodles point at the star in each case. That gave strong support to the idea that there is a link between the twinkling and the foreground stars. It also led to a specific geometric picture for the ionised gas: the filaments must have a radial orientation, so that they always appear to point at the star. Apparent alignments can arise by chance, of course, and a key question is "what are the odds of a chance alignment?" The picture is specific enough that the probability can be calculated, using catalogues that tell us how many stars there are within a given distance from the Sun. Hot stars are relatively rare, as it turns out, and the chances of finding one that is at just the right location to explain the observed twinkling, of either quasar, are small. The odds for getting both alignments by chance are very small indeed: about one in fifteen million. That, we decided, is good enough for us: twinkling is due to ionised gas around hot, nearby stars. But what is the ionised gas doing there? Where does it come from? The first thing we thought of is that the gas might come from the hot star, blowing from the surface like a wind. Many stars, including the Sun, are known to have such winds. We quickly discarded that idea, because the properties of the radio twinkling require gas densities that are millions of times greater than those of the stellar winds. But then we were stuck, because the current models of hot stars did not offer us any other source for the ionised gas. Something entirely new seemed to be required. 1. The gas is very dense. 2. The gas is in the form of radial filaments, centred on hot stars. 3. The filaments are grouped into distinct bundles. 5. The bundles are located at distances up to a few light-years from their host stars. 6. There are roughly 100,000 bundles around every hot star. The Helix Nebula - a nearby planetary nebula. At left is a composite image of the whole nebula, using data from the Cerro Tololo Inter-American Observatory and the Hubble Space Telescope. At right is a close-up of a small part of the inner nebula. 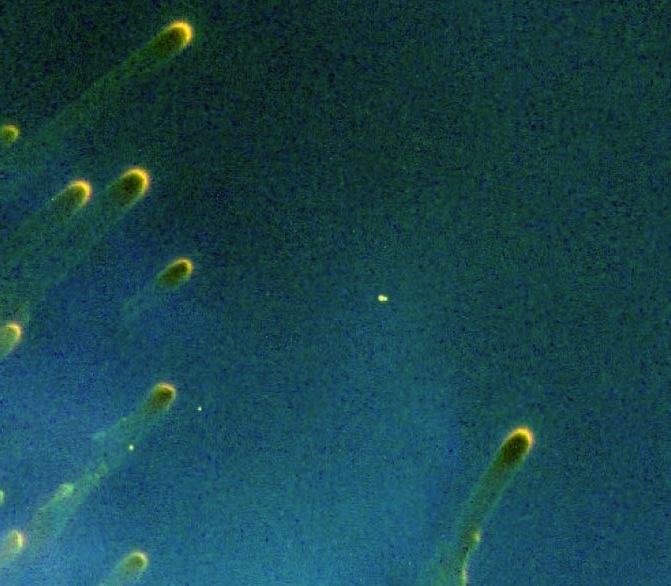 In the close-up image, half a dozen "cometary knots" can be seen. Each knot comprises a dense, dusty, molecular globule - which appears dark in this image - surrounded by a thin skin of ionised gas. The cometary tails all point away from the central star. The ionised gas in the Helix is studied through its emissions, not through its effect on background radio sources, so we don't know anything about fine-scale filamentary structure in the gas there. But we do know the following: the gas in the Helix is very dense; it occurs in distinct regions, usually called "cometary knots"; the tails of the cometary knots are all radially oriented around the central, hot star; the cometary knots have widths of a few hundred AU; the cometary knots are found at distances of roughly a light-year from the central star; and there are roughly 100,000 cometary knots in the Helix. Those characteristics correspond very closely to the properties that we listed above. And that strongly suggests that hot, nearby stars have populations of cometary knots, similar to the Helix, with those cometary knots being responsible for the radio twinkling of background quasars. And what are the cometary knots? 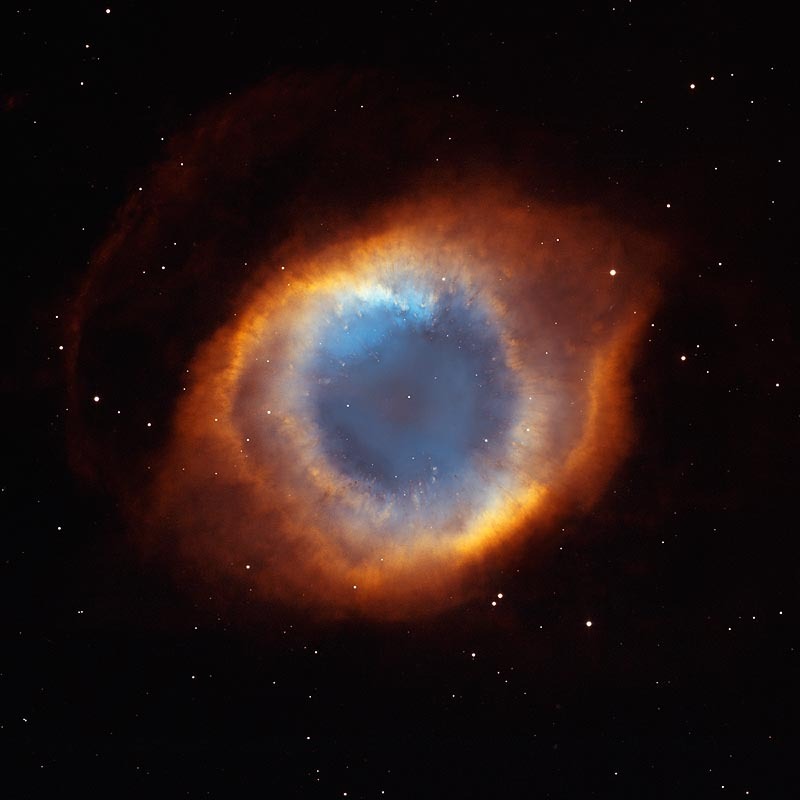 Previous studies, using a variety of techniques and telescopes, have largely answered that question for the Helix Nebula. There the individual cometary knots are known to consist of a globule of molecular gas, a few hundred AU in size, surrounded by a thin skin of ionised gas. It appears that ultraviolet photons from the central star of the Helix Nebula ionise the surfaces of the molecular globules, and the ionised gas then flows outwards, away from the star. Presumably, then, large numbers of molecular globules are also present around nearby, hot stars. And again, in that environment, the surfaces of the molecular globules would be ionised by the strong ultraviolet radiation from the stars. It's probably not just the nearby, hot stars that have populations of molecular globules around them. Radio twinkling of background quasars is both faster and stronger when the ionised gas is nearby. So by studying radio twinkling we are biasing our view towards nearby stars rather than distant ones. And what's more: cool stars would produce relatively little surface ionisation of any molecular gas around them, so we are also biased towards hot stars rather than cool ones. Conclusion: large numbers of molecular globules may be present around all types of stars, and throughout the Galaxy. Although we now have a better understanding of the origin of radio twinkling, these results raise some difficult questions. For example: where do the molecular globules come from? what is their role in star formation? and planet formation? These are deep questions, and it'll be some time before good answers can be given. But right now we're happy to be asking. For those interested, the scientific paper can be found here. And the 27th June 2017 press release can be found here.